NBC Foreign Correspondent Ayman Mohyeldin today tweeted about the killing of a palestinian he witnessed. Sounds like coldblooded murder, and I am sure that is what Mohyeldin was trying to portray. Any talk he was a terrorist carrying a knife is just what Israeli police claim. 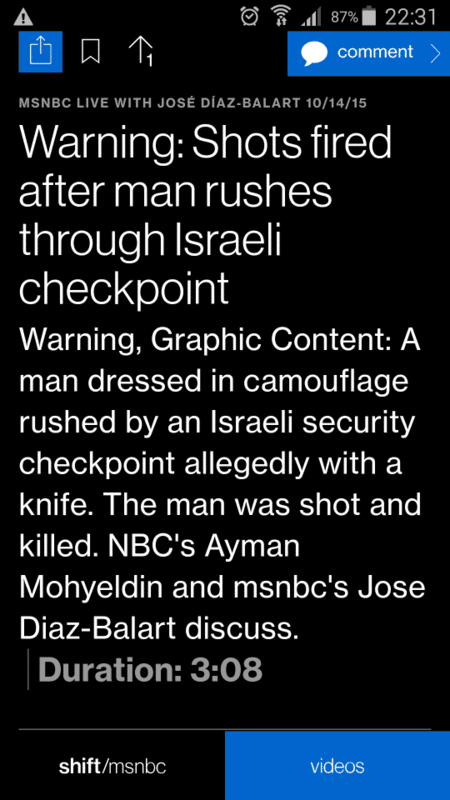 Mohyeldin’s report on the incident has the following headline: Ayman Mohyeldin’s NBC Team Captures Israel Shooting on Video. No mention of any attempted terror attack there. The fact he was carrying a knife (or rather appeared to be) is mentioned later on in the report. JERUSALEM — A man was shot dead by Israeli police Wednesday afternoon after rushing past a checkpoint in an incident caught on camera by an NBC News crew. 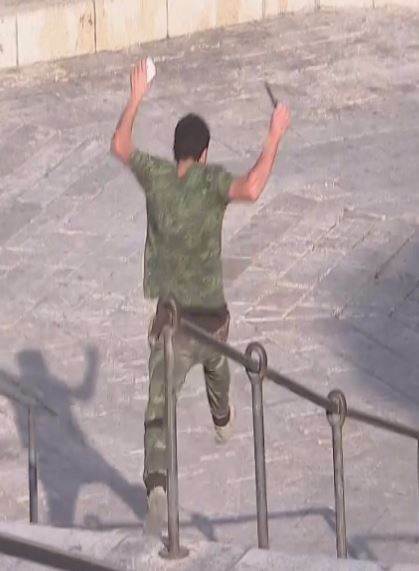 At least a dozen shots were fired at the man, who was wearing camouflage pants and appeared to be carrying a weapon in his right hand, after he ran past officers who yelled at him to stop near Jerusalem’s Damascus Gate. He fell to the ground and died at the scene, which is located in the mainly Palestinian East Jerusalem area. The incident came as Israel introduced heightened security measures in a bid to quell deadly violence that has wracked the region in recent days. Police spokesman Micky Rosenfeld said the man was a “terrorist” armed with a knife, adding on Twitter that officers had been responding to an “attempted stabbing attack.” That incident referenced by Rosenfeld did not take place in front of NBC News cameras. Note also the statement cameras did not capture the attempted stabbing attack. NBC has video of the man clearly running with the knife! As well as a still. I guess Mohyeldin has watched Crocodile Dundee one too many times. But seriously, how can anyone doubt the anti Israel bias of Mohyeldin and those who allow him to report like this? Update: Not surprisingly, Mohyeldin has shown his antipathy towards Israel in the past..
@AymanM 27 Israeli soldiers, 2 civilians (by rockets). That's 29. Pls get your facts straight. It's disrespectful. Thanks again to Becky Griffin.